DNA analysis and microscopy reveal a third organism in the symbiosis that forms coral. The finding underscores the functional and evolutionary complexity of the symbiotic relationships that support many ecosystems. Thomas A. Richards is in Biosciences, Living Systems Institute, University of Exeter, Exeter EX4 4QD, UK. John P. McCutcheon is in the Division of Biological Sciences, University of Montana, Missoula, Montana 59812, USA. Symbiosis is deceptively easy to define: two or more organisms live together in a long-term association. Coral, the partnership between an animal from the Anthozoa group and a microbial alga called Symbiodinium, is an archetypal model of symbiosis. The anthozoan provides a home for the alga, which uses photosynthesis to produce sugars that are given to the animal as ‘rent’1. These stable and highly productive two-player symbioses build the enormous reefs that shape marine ecosystems. Writing in Nature, Kwong et al.2 challenge this simple binary model of coral symbiosis by identifying a third player in the association. Microorganisms, by definition, are tiny, and as such are difficult to isolate, grow and study. The vast extent of microbial diversity has been recognized only in the past two decades, after the application of molecular-biology techniques to the field3. The majority of newly discovered microbial groups are cryptic lineages that greatly outnumber the ‘known’ diversity of life4, and are recognized only as DNA sequences stored in databases. We know little about what these microbes look like, how their cells function or what they do in an ecosystem. The challenge, therefore, is to map the DNA sequences that identify these microbes to physical cells, and to uncover the biology of such organisms. This is not an easy task. Two such types of mystery DNA sequence, called ARL-V (apicomplexan-related lineage-V) and type-N, have been consistently found in samples from coral ecosystems5. Phylogenetic trees that map how the organisms containing ARL-V and type-N DNA are related to known microbes suggest that these organisms belong to the Apicomplexa. This group includes parasites that infect terrestrial animals, such as the Plasmodium species that cause malaria, so understanding more about the provenance and evolution of the microbes these sequences represent is of broad interest. Many apicomplexan parasites live in the dark, but they contain the vestige of a plastid6, a DNA-containing structure found in plant and algal cells that is required for photosynthesis. The evolutionary origin of plastids in the Apicomplexa is poorly understood. Apicomplexan plastids are non-photosynthetic, but they have retained some biochemical pathways that are found alongside the light-processing pathways in photosynthetic plastids. Many of these pathways are potential targets of antimalarial drugs. Photosynthetic relatives of the Apicomplexa have also been discovered in marine environments7. But how do the elusive microbes that contain ARL-V and type-N DNA fit into this picture, and what can they tell us about coral ecosystems and the evolutionary history of the Apicomplexa? Kwong and colleagues were intrigued by the apparent association of the ARL-V/type-N DNA signature with corals and related species (Fig. 1). They screened DNA samples from 62 wild and aquarium species for the presence of type-N signatures, and found that 70% of the species were type-N-positive. 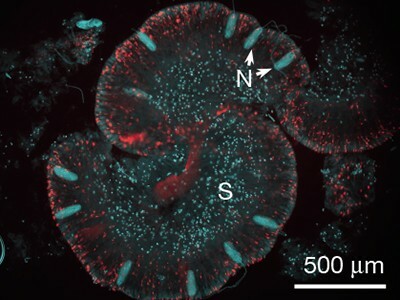 Using fluorescently labelled DNA probes, Kwong and colleagues then observed that type-N and ARL-V DNA molecules coexist in cells located inside the gastric cavity cells of the anthozoans. This pattern of localization of ARL-V/type-N cells in the coral is distinct from that of Symbiodinium algae, indicating that the newly identified symbionts participate in an anatomically separate interaction with the anthozoan animal. Electron microscopy showed that the ARL-V/type-N cells have many features typical of apicomplexan cells. The authors informally named the organisms ‘corallicolids’. Kwong et al. then used several genetic markers to investigate the position of corallicolids in the tree of life. This revealed a peculiar evolutionary placement: corallicolids are more closely related to terrestrial than to previously identified marine Apicomplexa. This finding inspired the authors to sequence the full genome of the corallicolids’ plastid, which led to another surprise. The corallicolids have retained genes encoding molecules that synthesize chlorophyll, the pigment that absorbs energy from light to enable photosynthesis. However, they have lost the plastid genes that encode the proteins of photosystems, which carry out photosynthesis. How might corallicolids avoid the toxic chemical effects resulting from the excitation of chlorophyll by light when they lack the normal outlet of a photosystem? There are two possible explanations, both intriguingly unlikely. In contrast to the situation in all known photosynthetic eukaryotes (species that carry their DNA in a nucleus), the genes that encode the photosystem proteins in corallicolids might be part of the nuclear genome, instead of being part of the plastid genome. After synthesis, these proteins would be transported into the plastid. Alternatively, corallicolids might have unique biochemical pathways involving chlorophyll that are not associated with photosystems. The term symbiosis is often used synonymously with mutualism, a relationship in which all partners benefit. This is a misapplication of the term that obscures much of the dynamic nature of these interactions8. The report by Kwong and colleagues is not the first case in which a classic model of two-player mutualistic symbiosis has turned out to be more complex than originally described. Many lichens — another archetypal model of symbiosis — are composed not of just one fungus and one alga, but of three or four evolutionarily stable partners9,10. Why are additional symbionts present in these associations? We suspect the answer relates to the nutritional nature of the symbioses. In both corals and lichens, an organism synthesizes carbon compounds and leaks them to another organism in exchange for housing and other benefits. It seems unsurprising that further organisms might exploit either the leaked compounds or the willingness of a larger organism to house a smaller organism. In the process of exploitation, these new players might bring a new beneficial function to the symbiosis. The challenge now is to identify the role of the extra parties in corals, lichens and many other symbioses, and to rethink the roles of the better-known partners in light of the new evidence. Do the additional players cause disease in the symbiosis? A formal test of Koch’s postulates11, which establish a causal link between a microbe and a disease, requires cell cultures. These are unavailable for corallicolids and most lichen-associated fungi, so a potential link with disease is difficult to determine. Do the new players provide some important nutritional12 or protective service for the symbiosis? Do they perform policing functions, ensuring community stability? We would not be surprised if many of the additional players identified in these symbioses had multiple and dynamic roles. Solving this riddle will be a challenge, but it should tell us a lot about how organisms perceive each other and interact in complex social contexts, and what kinds of interaction ultimately build the symbioses on which many ecosystems rely. Baker, A. C. Annu. Rev. Ecol. Evol. Syst. 34, 661–689 (2003). Kwong, W. K., del Campo, J., Mathur, V., Vermeij, M. J. A. & Keeling, P. J. Nature 568, 103–107 (2019). Pace, N. R. Science 276, 734–740 (1997). Hug, L. A. et al. Nature Microbiol. 1, 16048 (2016). Janouškovec, J., Horák, A., Barott, K. L., Rohwer, F. L. & Keeling, P. J. Curr. Biol. 22, R518–R519 (2012). McFadden, G. I., Reith, M. E., Munholland, J. & Lang-Unnasch, N. Nature 381, 482 (1996). Moore, R. B. et al. Nature 451, 959–963 (2008). Wooldridge, S. A. BioEssays 32, 615–625 (2010). Spribille, T. et al. Science 353, 488–492 (2016). Tuovinen, V. et al. Curr. Biol. 29, 476–483 (2019). Fredericks, D. N. & Relman, D. A. Clin. Microbiol. Rev. 9, 18–33 (1996). Lesser, M. P., Mazel, C. H., Gorbunov, M. Y. & Falkowski, P. G. Science 305, 997–1000 (2004).